I’m a man who tries to err on the side of optimism, but last week’s events took me on a detour to the less than sunny side of the street. And while I have no right to complain about anything, I did find something to grouse and whine about in the privacy of my own home and in the company of four furry sympathetic ears: a failed filling and cracked tooth. Tooth nerve pain is unlike anything I’ve ever experienced, and this being my first time for such a dental misadventure, I hope it is my last. I tried to buck up and “be a big boy” as the saying goes, but it was a real struggle not to be a whiny baby, rocking myself to sleep in the fetal position and sobbing, “Why, why, why?” Countless phones calls and four days later I finally got in to see the first available Endodontist in a two-state radius. And since I’m a silver lining kind of guy, I won’t dwell on the details of my root canal and scheduled fix, though I suggest for your own good (physically and financially) you keep popcorn kernels, ice cubes and corn nuts out of your mouth and treat your teeth like delicate eggshells. 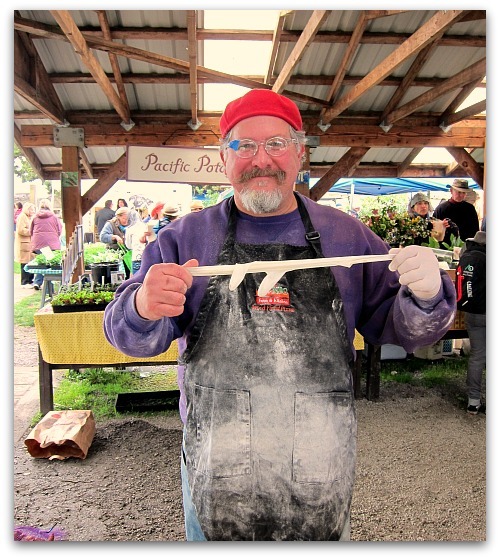 Big Boy as Dough Boy: Working through the pain, rolling pizza dough for La Biondo Wood Fired Pizza at the Vashon Farmers Market. As my mouth begins to heal, so does my attitude. I may have been out of commission for most of the week, but a bad tooth can surely remind you of your good life, and the friends and family who try to make you feel better, who call regularly (and suggest gargling with bourbon), who bring you homemade soup and fresh eggs, who sneak a pair of hand-knit socks in your mailbox, who drive you to the dentist and who keep you from using farm equipment when your medication suggests it’s not such a good idea. Here’s to your happy teeth, dental health and a pain-free smile. As for the greenhouse, a bad tooth and record rainfall kept me from finishing it last week, but a sunnier forecast on all counts should make its completion date a possibility in the days to come. Hi Tom! I found your blog while searching for some information on gardening. I live in Arizona so gardening presents it’s own specific set of problems out here. I am trying again this year….I must be a sucker for torturing myself. 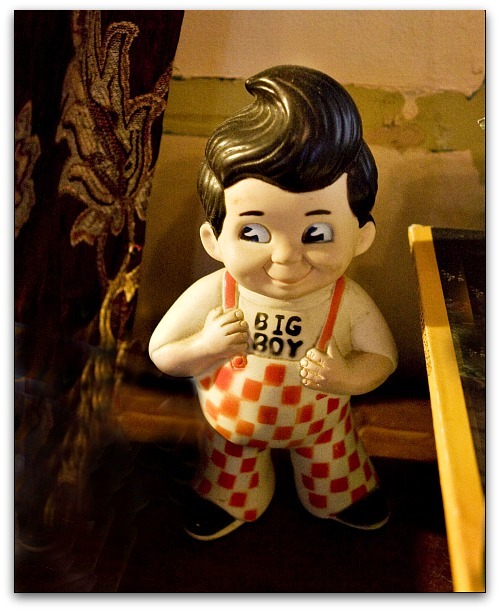 I remember the Big Boy restaurants! Wonder how many of your readers will too. Hi Sandy, Welcome! I used to live in Tucson as a teenager. I grew huge cabbages there in the winter. Good luck on gardening in the dessert, there’s a lot to learn. Maybe go on several community garden tours and see what other gardeners are doing. The Sonoran dessert is gorgeous, perhaps the easiest thing is to work with a natural plant palette, as water will always be an issue. Thanks again for the introduction! Oh Tom, so glad things are looking up for you. And Phoebe…I want to be Phoebe’s neighbor. I can just tell she is a treasure. Indeed she is Susan, 90 years old and slogging through the rain to see if I’m okay. You have some wonderful people in your life. That alone cancels out a bum tooth. Glad you’re on your way back to good spirits. So true Sue, I’m a lucky guy. Thanks for the well wishes. Sorry to hear about your toothie-peg, Tom. I hope that repairs aren’t too painful especially on the financial side. Can’t decide which would be better- hand knitted socks or the gargle remedy? Probably socks. That gate is rather noice too (as is the Phoebe smile). 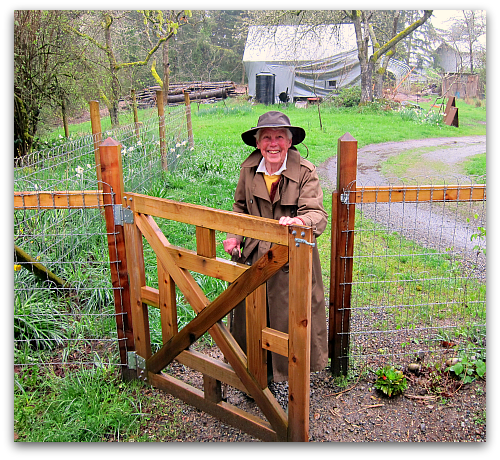 Did you design the gate yourself? Thanks Jacqui, yep it’s amazing how much a simple visit costs to the dentist. In terms of produce, I’d my last visit cost the equivalent of 180 bunches of kale. 😉 As for the gate, yes I designed the gate and my friend Jon helped me build so it would last more than a year. Glad your tooth is on the mend. Add cherry pits to the list of saboteurs of the tooth. I cracked a molar while eating cherries which led to the endodontist, and yadda, yadda big bill. Tom- so glad tooth’s all fixed- I too want to live next to Phoebe. Please send her along with your mom. Thanks for the visit and kind words Terrie! Tooth pain is some of the worst pain out there, but it sounds as tho’ Vashon Island is the place to be when hurting. A great community and great friends. But I have to ask, was Boz concerned at all? Gracie, at least, seems to be showing a bit more compassion. Eileen, I believe Boz was a bit put off as I would not let him nap on top of me. 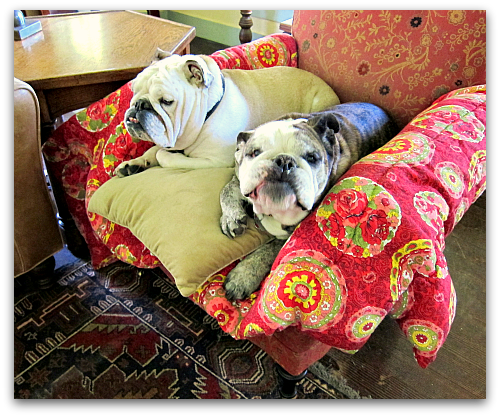 A slumbering 65 pound bulldog resting across your chest is okay most days, but bad tooth day was not one of them. Tom – glad your tooth is fixed and you are on the mend. There is nothing worse than tooth pain. I would even take child birth over a toothache, LOL! Thanks Ina, apparently, the tooth was too cracked to save, so back in this week to have it pulled. Ugh. 3 more words my friend: I LOVE YOU! Thanks you my awesome healer and dispenser of love, kindness, hope and support. Love you right back! Tom, Happy to hear that your tooth has been repaired -throbbing pain be gone! I second oil of cloves-used to take it with me to the backcountry just in case. 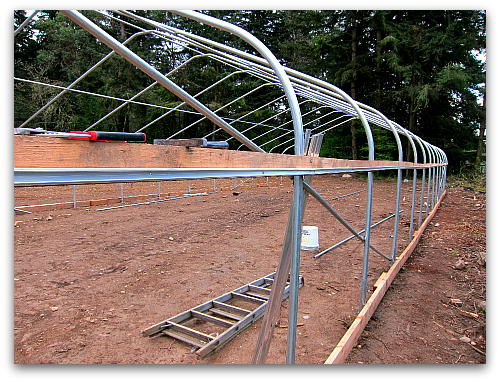 Tom, I wonder if you could send me a pic of how the greenhouse ribs come together at the ridgeline. John and I are building a moveable greenhouse(only 13 x15) but are struggling with how to make the gothic arch connections. I will give clove oil a try, thanks, and I sent you an email about connecting the gothic arches. Let me know how that works. Come on down for a dram and we can swap tooth tales and endodonic epics!! Glad things are resolved for future orational capacity! Nice to see you on the ferry today, and our mini-dental support group, helped my attitude immensely. I am sorry you have been hurting; this post reminded me of the worst pain I experienced : childbirth the natural way (what a joke! ); I really thought I was going to die. looking forward to the greenhouse. got one built here and the shoots are getting moved to other locations in the orchard. Joumana, talk about putting down ‘roots’ …sounds like life if good in your beautiful mountains of Lebanon. Glad you are feeling better. 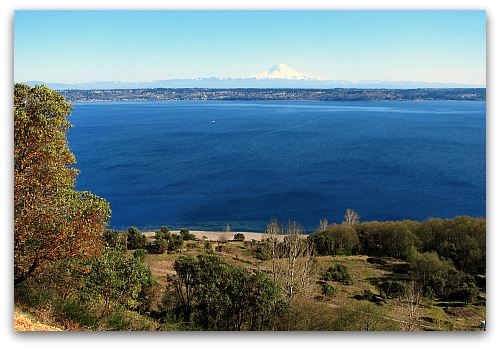 The view from Maury Island is spectacular.